Sihanoukville, Kampot, and Kep are three neighboring cities on the southern coast of Cambodia that cater to different types of travelers. If you’re more of a party animal and enjoy a younger backpacker vibe, bounce over to Sihanoukville. If you like a greener and relaxed environment, Kampot is a great choice. Finally, there’s Kep, a mellow province that combines the best of the latest with a bonus: seafood! We first arrived near Sihanoukville after a 5 hour trip from Phnom Penh with Capital Tours. It was a $5 bus ride with TV, Cambodian karaoke and a honking bus driver with Tourette’s syndrome of the hands! Apparently, honking it’s like a national habit—everyone is really committed to it. 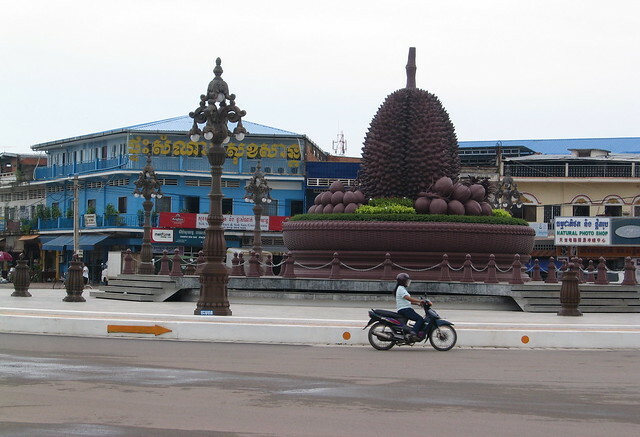 – Sihanoukville! Exit here. Exit! A bit confused and concerned to see our backpacks being taken away, we got off the bus along with all the other tourists, while the remaining locals on the bus laughed. As soon as all foreigners got off, the bus left straight to Sihanoukville. There we were, stuck in an odd gas station with no other choice but to haggle a tuk-tuk ride to Sihanoukville. Everyone was furious and the negotiation process got a little bit heated. We ended up splitting a tuk-tuk with two Swedish girls and paid $4 each for what ended up being an 8-minute ride. At Sihanoukville, we stayed in Zana Beach Guesthouse for $12 the room, not the cheapest but quite nice and an 8-minute walk from Serendipity beach. Tons of new accommodations are being built there as a result of tourist demand, unfortunately, this is having a big toll on the landscape as rubble ends up everywhere: sand, ocean, surf areas, gutters and mountain slopes. Serendipity is probably the best spot for wild party-prone backpackers. It’s full of party-oriented accommodations, bars, western restaurants and tours agents selling tickets for booze-cruises. If you’re looking for fun in the sun, this is it! During the day you can hang around the beach, swim, eat barbecued corn or grilled skid from vendors passing by. As the sun begins to set, music volume begins to rise and lounge chairs, tables, and torches furnish the beach for all night partying. If you’re willing to walk around though, you can find beaches with different vibes. In a 15-minute walk north of Serendipity is the peaceful Independence Beach, and pedaling for 25 minutes, can take you to Sokha Beach with tempting warm waters and white sands maintained by the resort close by. Something peculiar we noticed in all Cambodian beaches was that most locals go in the ocean fully clothed. It was funny to watch dressed-up girls leaving their purses in the sand and getting soaked and pounded by the waves. I guess excuses like “I wanted it to get in, but I left my bathing suit at home…” are not valid here. In Serendipity as in any other beach destination, meals tend to be more expensive. Fortunately, we found a7 Makara Street 200, right next to the Golden Lions roundabout. The street is flanked on both sides with local restaurants and our favorite was called Chanreaksmey—the average meal was $2.05. Go there and pick anything on the menu, seriously anything. You’re welcome! It had the best food I’ve tasted in our entire trip. We stayed 6 days in Sihanoukville: 4 days to visit and 2 more waiting for our visa processing at the consulate of Vietnam. As a well-known crossing point for backpackers traveling through South East Asia, Vietnam has a consulate here. We went from Sihanoukville to Kampot on a minivan. We bought our tickets for $5 in Champa, a travel company with a name of laundry soap. It took 2 hours for the van to stop near the Durian Roundabout, kind of a landmark here—just like the actual durians are. Have you ever tasted one? They’re like a creamy love child of a cantaloupe and a cabbage and have quite a pungent smell, so it’s common to see signs prohibiting durians in hotel rooms and carriers. Kampot is a quieter city along the River Praek Tuek Chhu: a river you can kayak, swim and go on sunset cruises with an occasional beer in the mix. Here you won’t find as many partygoers though. Along the river, French influences are more noticeable in the architecture. You’ll find restaurants, bars, shops and accommodation with slightly higher prices that you can avoid if you’re willing to walk a bit more into the city. Shops tend to close early, so remember to get an early dinner. Our accommodation was near the durian roundabout: Sebana Guesthouse. We paid $7 a night, breakfast included. Initially, we planned to stay 2 days in Kampot and 1 day in Kep, but Kampot felt right, so we decided to linger and rent a scooter to visit Kep—even without having driven one before. Ever. 2) Never drive with the lights on during the day. Traffic in Cambodia is wild! Speed limits are just reference points for pussies. People drive in the opposite direction, talk on the phone, and horns are their blinking lights, rear lights and a way to say ‘hello’. But it was also quite common to see 9-year-olds driving motorbikes, so there wasn’t much we could do wrong. A couple of hours later we were at the Bokor National Park. Now don’t let the name fool you because it’s probably not like the ‘National Parks’ you’ve been on. Even though it has beautiful green hills and great views, there is no nature trails or wildlife to see. You can go on hikes, but a guide is recommended due to the risk of landmines still existing off the pathways. We used the long swerve roads in the park to improve our riding skills as we passed by a big meditating Buddha – Lok Yeay Mao, old abandoned buildings and a new Casino at the top. It’s worth the trip, the landscape is great all the way up and the old buildings are fun to explore, just make sure you take a jacket, snacks and a full tank of gas. Gas stations in Kampot give you free drinks and snacks when you fill your tank. 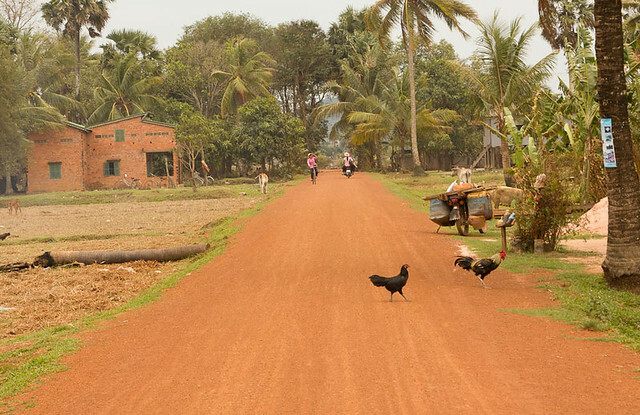 On our way back we did a little detour through red dusty roads with the intent of visiting the salt flats of Kampot. We arrived late in the afternoon and had the opportunity to watch some workers raking and hauling little piles of salt through the mirrored water. It reminded us of the saltpans in Aveiro, our town back in Portugal. The next day we rented the scooter again and drove 1h30 to Phnom Chhnnork, a pre-Angkor temple inside a cave. You can get there easily using Maps.me and when in doubt, ask around, locals are always super helpful. 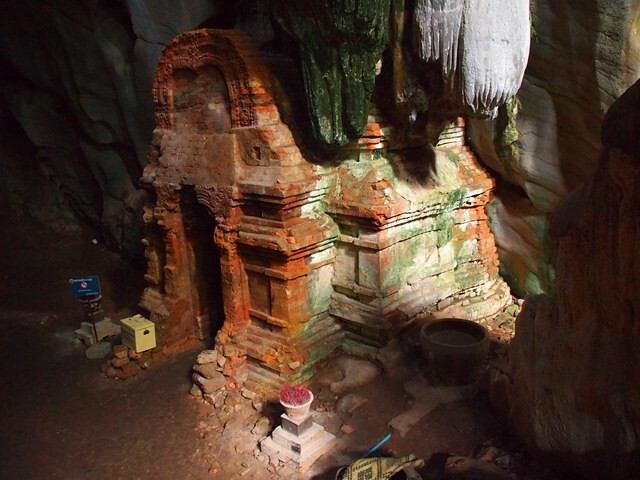 The entrance fee to the temple is $1 and you’ll have the opportunity to go through a dark tunnel inside the cave. You’ll find a bunch of kids with flashlights waiting to guide tourists through the tunnels, they speak good English and expect a $5 tip for the tour. But you can negotiate. We didn’t cross the tunnel though, it felt claustrophobic and smelled like bat pee. After the cave-temple, we drove to La Plantation, a pepper plantation that was not easy to find. On the way there we stopped by the Secret Lake that turned out to be not actually a lake but a dam. Cambodians grew pepper for over a thousand years before the European traders arrived, but with the help of the French during the colonial administration, production augmented by tenfold. It became all the rage in French restaurants, sadly during the Khmer Rouge regime pepper fields were abandoned. Today the business has reborn and is visible at La Plantation, a 10-hectare pepper farm specialized in the organic production of this hot spice. You can go on a free 10 minutes guided tour through the pepper fields, they’ll show you around and explain a little bit of the production process. After the tour, they’ll take you to a little cafe on a gazebo to taste the peppercorns—and buy some if you want, of course. We left La Plantation planning to have lunch at Kep, a town well-known for its great fish and seafood, but the sloping dirt roads and opposite information didn’t make it easy. The trip took us around 40 minutes. The first thing we saw was the crab market, bustling with people negotiating over pyramids of seafood, fresh fish, grilled fish, and fruit. Restaurants overlooking the sea invite you in to taste the catch of the day, while fishermen walk along the seashore fishing for something more. With a full stomach, we headed to Kep’s only beach, a small bay with a thin stretch of sand protected by hills that tend to get pretty crowded on the weekends. There weren’t many people around that day, just some local families picnicking in the sidewalks. We couldn’t find any town center as things seemed a bit scattered here and there. Maybe it was a good call to stay in Kampot after all. If you have any questions or some extra info everybody can benefit from, please leave it in the comments! How difficult was it to ride the scooters? I’m going to be in Kampot and Kep in November and I have never driven a scooter before and have thought about renting one for the day. I’m a woman travelling on my own and I just worry that if I run into trouble, that I’ll be stuck without help and a scooter I don’t know how to use properly. Would it just be easier hiring a tuk-tuk and driver for the day? The first time both of us drove a scooter was in Kampot, but we only did it due to the improvised driving lesson before and because it was surprisingly easy to drive. Although it was a fun experience (because it all went well), traffic was chaotic at times. Now, considering you’ll be doing it by yourself and your lack of experience driving a scooter, it will always be safer to rent a tuk-tuk for the day. Just be prepared to haggle. Great impression on southern Cambodia there! 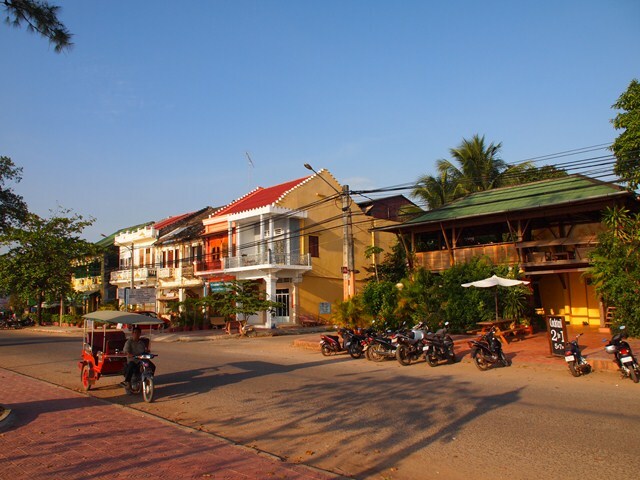 Sihanoukville, Kep and Kampot sure are great places in the relaxed south part of Cambodia. Love the beaches and tasty crab and Bokor Hill. Cambodia sure is awesome. ?